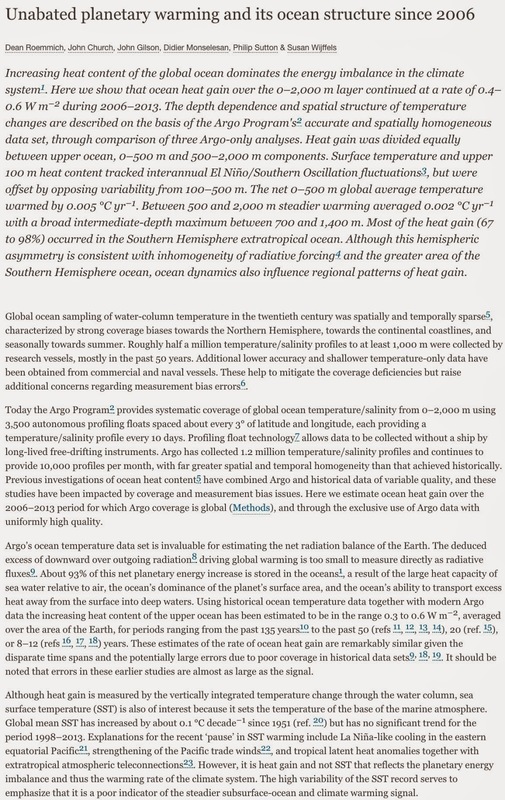 A paper published today in Nature Climate Change claims "Unabated planetary warming...since 2006" of the world's oceans of a tiny 0.005C/year from 0-500 meter depths and an even smaller 0.002C/year for the 500-2000 meter depths. This rate is equivalent to only 0.2°C to 0.5°C ocean warming per century, far less than the 3°C global warming by 2100 central estimate of the IPCC. According to the authors, "the ocean heat gain over the 0-2000 meter layer continued at a rate of 0.4-0.6 W/m2 during 2006-2013." 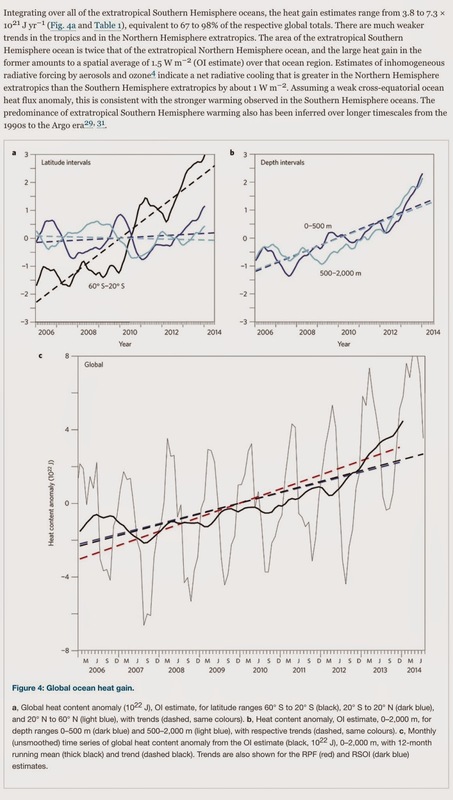 However, according to the IPCC, net anthropogenic forcing is warming the planet at a rate of 1.6 W/m2 or ~3.2 times more than the central estimate of this new paper. This implies a climate sensitivity about 70% less than claimed by the IPCC. 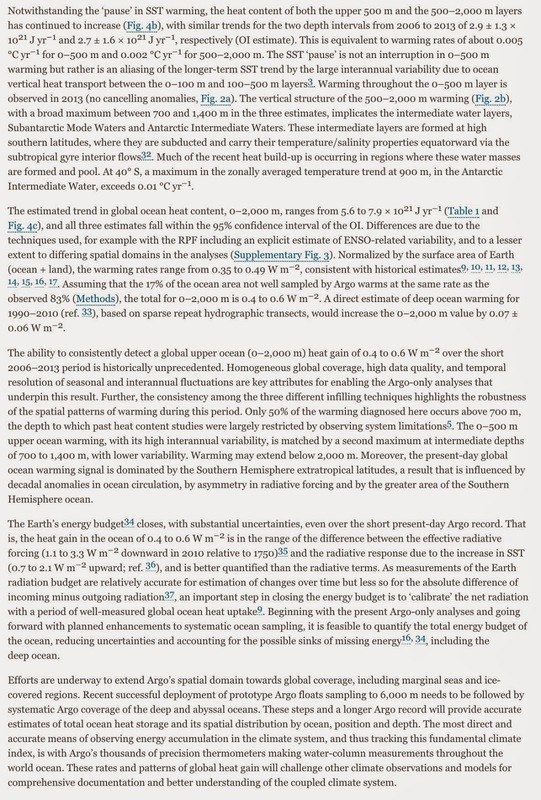 Alarmists claim "90% of the 'missing heat' from greenhouse gases is going into the ocean," therefore, using the central estimate of this paper of a warming rate of 0.5 W/m2, total net anthropogenic forcing of oceans + atmosphere would be 0.5*1.1 = 0.55 W/m2, again far less (66% less) than the 1.6 W/m2 net anthropogenic forcing at present claimed by the IPCC. The above estimates falsely assume, for the purposes of argument only, that all of the ocean warming is due to increased greenhouse gases. 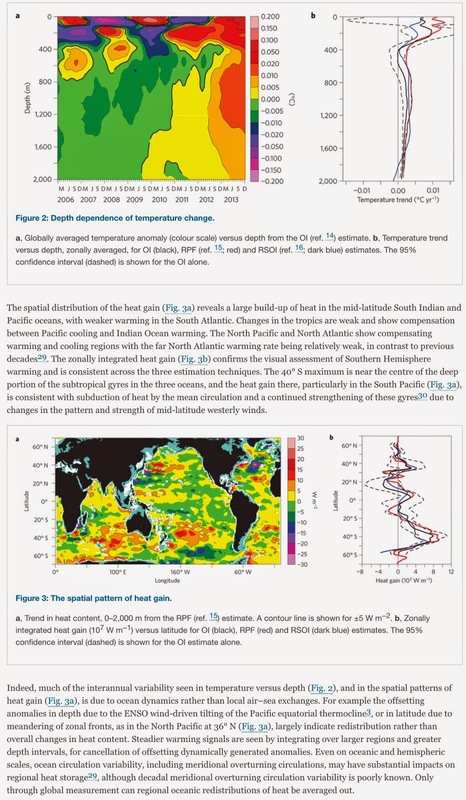 However, IR radiation from greenhouse gases cannot significantly warm the oceans for at least 3 thermodynamic reasons as outlined here and here. 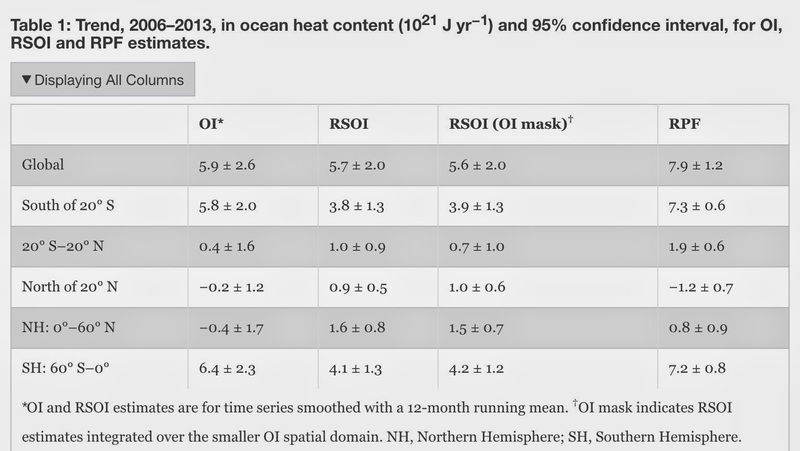 Changes in solar insolation modulated by cloud cover and ocean oscillations are not even considered or discussed by this paper as potential mechanisms of the ocean warming patterns noted, but are far more likely to be the cause of any warming observed. 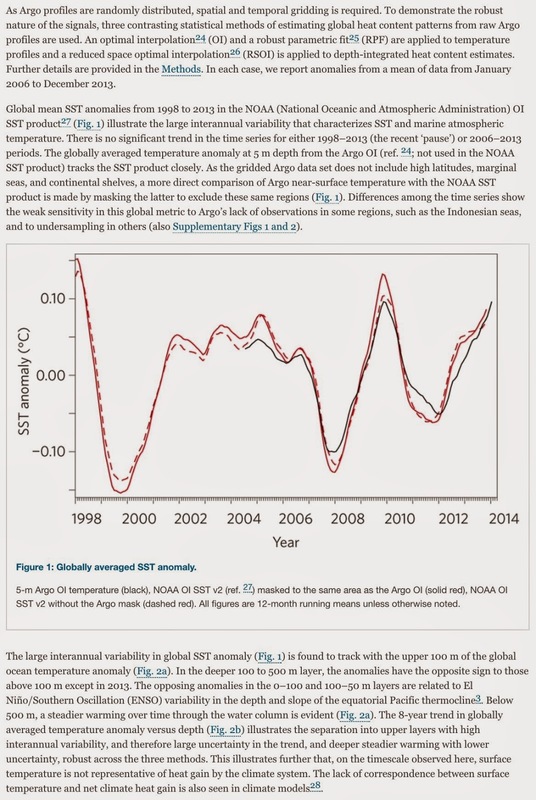 Heat rises, and surface data indicate no global warming for 18+ years. How can zero degrees atmospheric warming cause the oceans up to 2000 meters depth to warm 0.002C/yr? It cannot, without violating thermodynamics. Table 1 below shows all of the warming occurred in the Southern Hemisphere 0-60S, whereas the Northern Hemisphere 0-60N actually cooled from 2006-2013. This warming pattern is incompatible with anthropogenic forcing from well-mixed greenhouse gases, which is alleged to be relatively uniform across the planet, and thus the spatially limited warming to the Southern Hemisphere alone is far more likely due to changes in ocean oscillations and/or solar insolation from cloud cover changes. For these reasons and others, the claim of unabated anthropogenic warming of the oceans from greenhouse gases since 2006 is unwarranted. Fig TS 5 from the latest IPCC Report claims a continuous net anthropogenic forcing of 1.6 W/m2 at present, far greater than that found by this new paper.